Begin your free 14-day trial now! How many open positions do you usually simultaneously have? 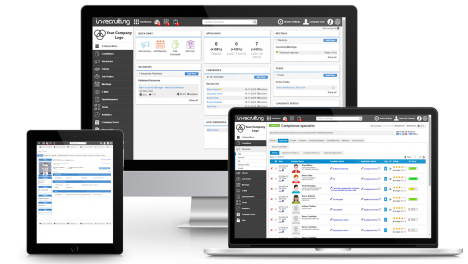 In-recruiting is a next generation Applicant Tracking System. The recruiting software that helps recruiters to find and manage talent, reducing the time and cost of hire. We chose In-recruiting for its intuitive interface, the ability to search candidates by multiple filters, and the unlimited multi-posting of ads on lots of Job boards with just one click. We’re satisfied with the increase in candidates and the improvement in being able to track them. “Thanks to In-recruiting we’ve achieved greater efficiency in the management of the entire recruiting process, from publishing vacancies to searching candidates with keywords, candidate profile sharing as well as the optimisation of cost and time from activating a new vacancy up to the closing stage of the selection. Your In-recruiting Free Trial has a duration of 14 days, is totally free, does not require any payment method and will expire automatically after 14 days. During the Free Trial you will have access to all In-recruiting features, with no limits, and you can use the Online Help Desk and Support. We will send you an email notification the day before the expiration of the Free Trial. You’ll have the option to choose a plan that fits your needs or you can simply download all of your information from the platform using our advanced export engine. © 2017 In-recruiting. All Rights Reserved.